Finally, I've written a separate Page that chronicles the journey from when I first picked up a needle back in the early 1950's to "where I am" now. It's titled "Here I Am" and is linked to in my sidebar under the section for "Pages" or here. Thanks for sharing your story. I wonder if my mother had any of your booklets in her sewing basket. 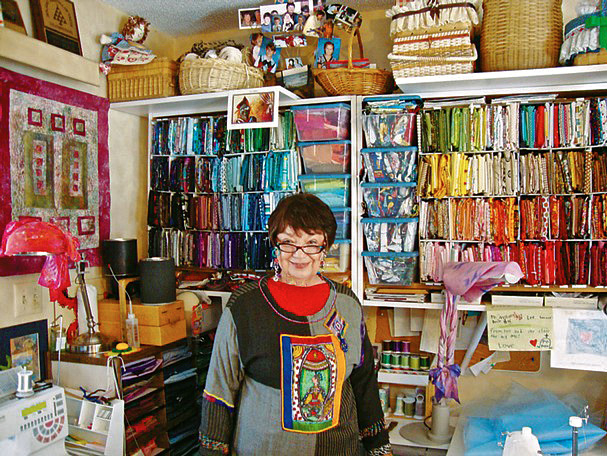 I love the photo of you in your studio filled with glorious fabrics and colors. What a fascinating and colourful journey Nellie, and there is yet more to come. That is such a fantastic photo, I could spend hours looking at it. You are certainly an achiever. Congratulations on making such a wonderful contributtion to the world of Art and Stitch. love this pic of you in your studio! Wow! That is quite a career! How lucky to have a MIL in the fabric industry. Your studio looks like an inspiring place. I'm sure many more works of art will be created there. Gosh, where to start? the photo of you with the fabric backdrop, well, just plain mind boggling!What an adventure you've had to this point, can't wait to see where it continues to take you. In some ways mine is similar, macrame, off-loom weaving, making clothes and so on. I imagine it's the same for most fabric/quilt artists. Thanks for sharing your story so that I can remember mine. hugs!!! Fabulous picture! I just love all that beautifully arranged fabric in the background. You were and are such a cutey! Love this photo of you in your jam packed studio of color. Loved your story. Oh I remember those days of macrame mania. I had a hanging macrame table in my living room for a while. A round piece of glass was put in the middle. How interesting how life leads us in different directions but yet keeps us using the common denominator of needle, thread and textiles.